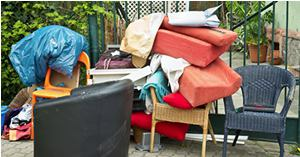 Rubbish Clearance Ltd offer fixed price waste removal services for homes and businesses in London, Essex and Berkshire. We have over 10 years experience in the waste management industry operating professional and reliable services to both domestic and commercial clients. Find out about green waste removals. Are you hunting for a fully licensed, locally based team that can collect and remove of your waste cleanly, appropriately and within the law? Then we can help. Call us on 0800 138 9100. We are a established UK waste management company based in Essex and we also operate in London and Berkshire. The Rubbish Clearance team do all of the loading and clearing up so you don't have to. We take away single items or full loads. Waste we can dispose of include lorry tyres, piles of topsoil / dirt, washing machines and computers. Contact us to find out more. We provide a variety of waste collection services seven days a week. We work around your busy schedule collecting your household rubbish, building waste and unwanted junk when it’s most suitable for you. Just call us or book online and we will take care of everything. All waste will be disposed of safely. We are fully licensed with environmental agency and have every waste carrier license to carry and dispose your waste. We have our own fleet of specialist waste collection vehicles covering London, Essex, Berkshire, Surrey and Sussex. Want a fee quote or need help estimating the load size? Click here for general prices.